This is a great Asian way to eat beef. The lime sauce that accompanies is perfectly sharp and marries fantastically with the garlicky beef. It’s awesome, try it. To make the marinade, combine the oil, mushroom soy, normal soy and sugar in a bowl until the sugar dissolves. Add the garlic and pepper and mix well. Add the beef and coat well, cover and refridgerate for 1-2 hours. Meanwhile, dry roast the peanuts in a small oil free pan until they turn golden. Set aside to cool, then chop roughly. To make the dipping sauce, stir the sugar into the lime juice until it dissolves add the garlic and black pepper and stir well. When the beef has marinaded. Heat a wok with a little oil until hot. Add the beef and sear and char a little the meat on all sides. 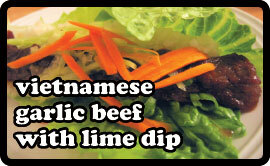 Eat the beef wrapped in a lettuce leaf with a few peanuts, some onion slices and a little carrot sprinkled over, dip in the lime sauce as you go.